Watson is an artificially intelligent computer system capable of answering questions posed in natural language, developed in IBM's DeepQA project by a research team led by principal investigator David Ferrucci. Watson was named after IBM's Thomas J. Watson. The computer system was specifically developed to answer questions on the quiz show Jeopardy!. In 2011, Watson competed on Jeopardy! against former winners Brad Rutter and Ken Jennings. Watson received the first prize of $1 million. In February 2013, IBM announced that Watson software system's first commercial application would be for utilization management decisions in lung cancer treatment at Memorial Sloan–Kettering Cancer Center in conjunction with health insurance company WellPoint. IBM Watson’s business chief Manoj Saxena says that 90% of nurses in the field who use Watson now follow its guidance. Watson is a question answering (QA) computing system that IBM built to apply advanced natural language processing, information retrieval, knowledge representation, automated reasoning, and machine learning technologies to the field of open domain question answering. The system is workload optimized, integrating massively parallel POWER7 processors and being built on IBM's DeepQA technology, which it uses to generate hypotheses, gather massive evidence, and analyze data. Watson is composed of a cluster of ninety IBM Power 750 servers, each of which uses a 3.5 GHz POWER7 eight core processor, with four threads per core. In total, the system has 2,880 POWER7 processor cores and has 16 terabytes of RAM. According to John Rennie, Watson can process 500 gigabytes, the equivalent of a million books, per second. IBM's master inventor and senior consultant Tony Pearson estimated Watson's hardware cost at about $3 million. Its performance stands at 80 TeraFLOPs which is unfortunately not enough to place it at Top 500 Supercomputers list. According to Rennie, the content was stored in Watson's RAM for the game because data stored on hard drives are too slow to access. Watson's software was written in various languages, including Java, C++, and Prolog, and uses Apache Hadoop framework for distributed computing, Apache UIMA (Unstructured Information Management Architecture) framework, IBM’s DeepQA software and SUSE Linux Enterprise Server 11 operating system. According to IBM, "more than 100 different techniques are used to analyze natural language, identify sources, find and generate hypotheses, find and score evidence, and merge and rank hypotheses." When presented with a question Watson would use thousands of algorithms simultaneously to find answers, then compile those answers to determine its level of confidence in any given answer. When playing Jeopardy! all players must wait until host Alex Trebek reads each clue in its entirety, after which a light is lit as a "ready" signal; the first to activate their buzzer button wins the chance to respond. Watson received the clues as electronic texts at the same moment they were made visible to the human players. It would then parse the clues into different keywords and sentence fragments in order to find statistically related phrases. Watson's main innovation was not in the creation of a new algorithm for this operation but rather its ability to quickly execute thousands of proven language analysis algorithms simultaneously to find the correct answer. The more algorithms that find the same answer independently the more likely Watson is to be correct. Once Watson has a small number of potential solutions, it is able to check against its database to ascertain whether the solution makes sense. In a sequence of 20 mock games, human participants were able to use the average six to seven seconds that Watson needed to hear the clue and decide whether to signal for responding. During that time, Watson also has to evaluate the response and determine whether it is sufficiently confident in the result to signal. Part of the system used to win the Jeopardy! contest was the electronic circuitry that receives the "ready" signal and then examined whether Watson's confidence level was great enough to activate the buzzer. Given the speed of this circuitry compared to the speed of human reaction times, Watson's reaction time was faster than the human contestants except when the human anticipated (instead of reacted to) the ready signal. After signaling, Watson speaks with an electronic voice and gives the responses in Jeopardy!Template:'s question format. 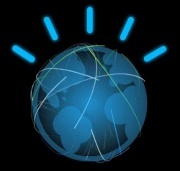 Watson's voice was synthesized from recordings that actor Jeff Woodman made for an IBM text-to-speech program in 2004. Watson, Ken Jennings, and Brad Rutter in their Jeopardy! exhibition match. Watson's basic working principle is to parse keywords in a clue while searching for related terms as responses. This gives Watson some advantages and disadvantages compared with human Jeopardy! players. Watson has deficiencies in understanding the contexts of the clues. As a result, human players usually generate responses faster than Watson, especially to short clues. Watson's programming prevents it from using the popular tactic of buzzing before it is sure of its response. Watson has consistently better reaction time on the buzzer once it has generated a response, and is immune to human players' psychological tactics. Although the system is primarily an IBM effort, Watson's development involved faculty from Rensselaer Polytechnic Institute, Carnegie Mellon University, University of Massachusetts Amherst, the University of Southern California's Information Sciences Institute, the University of Texas at Austin, the Massachusetts Institute of Technology, and the University of Trento, as well as students from New York Medical College. The prizes for the competition were $1 million for first place (Watson), $300,000 for second place (Jennings), and $200,000 for third place (Rutter). As promised, IBM donated 100% of Watson's winnings to charity, with 50% of those winnings going to World Vision and 50% going to World Community Grid. Likewise, Jennings and Rutter donated 50% of their winnings to their respective charities. On February 28, 2011, Watson played an untelevised exhibition match of Jeopardy! against members of the United States House of Representatives. In the first round, Rush D. Holt, Jr. (D-NJ, a former Jeopardy! contestant), who was challenging the computer with Bill Cassidy (R-LA), led with Watson in second place. However, combining the scores between all matches, the final score was $40,300 for Watson and $30,000 for the congressional players combined. Commentator Rick Merritt said that "there's another really important reason why it is strategic for IBM to be seen very broadly by the American public as a company that can tackle tough computer problems. A big slice of Big Blue's pie comes from selling to the U.S. government some of the biggest, most expensive systems in the world." In November, 2013, IBM announced it would make Watson's API (application program interface) available to software application providers, enabling them to build apps and services that are embedded with Watson's capabilities.1 To build out its base of partners who create applications on the Watson platform, IBM consults with a network of venture capital firms, which advise IBM on which of their portfolio companies may be a logical fit for what IBM calls the Watson Ecosystem. 2 Thus far, roughly 800 organizations and individuals have signed up with IBM, with interest in creating applications that could use the Watson platform. In February 2011, it was announced that IBM would be partnering with Nuance Communications for a research project to develop a commercial product during the next 18 to 24 months, designed to exploit Watson’s clinical decision support capabilities. Physicians at Columbia University would help to identify critical issues in the practice of medicine where the system's technology may be able to contribute, and physicians at the University of Maryland would work to identify the best way that a technology like Watson could interact with medical practitioners to provide the maximum assistance. Despite several scientifically promising demonstrations and agreements, IBM has had difficulty turning Watson into a successful business venture. On January 9, 2014 IBM announced it is creating a business unit around Watson, led by senior vice president Michael Rhodin. IBM Watson Group will have headquarters in New York's Silicon Alley and will employ 2,000 people. IBM has invested $1 billion to get the division going. Watson Group will develop three new cloud-delivered services: Watson Discovery Advisor, Watson Analytics, and Watson Explorer. Watson Discovery Advisor will focus on research and development projects in pharmaceutical industry, publishing and biotechnology, Watson Analytics will focus on Big Data visualization and insights on the basis of natural language questions posed by business users, and Watson Explorer will focus on helping enterprise users uncover and share data-driven insights more easily. The company is also launching a $100 million venture fund to spur application development for "cognitive" applications. According to IBM, the cloud-delivered enterprise-ready Watson has seen its speed increase 24 times over - a 2,400 percent improvement in performance, and its physical size shrunk by 90 percent - from the size of a master bedroom to three stacked pizza boxes. ↑ Kosinski, R. J. (2008). A literature review on reaction time, Clemson University. ↑ Lohr, Steve. "Creating AI based on the real thing", Dec 05, 2011 on The New York Times. This page was last modified on 12 February 2014, at 23:56.